Interactive online map of diamonds production. World map of diamond resources yield for 2016 exercise. "World Diamond Production" is a free online knowledge level game to find which country produce the most carats of diamond for 2016. 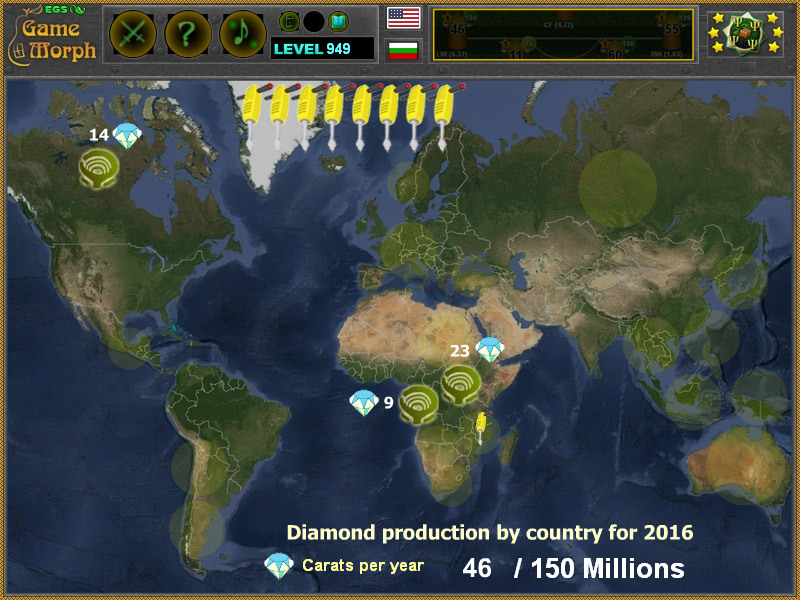 Interactive world map of diamond production. 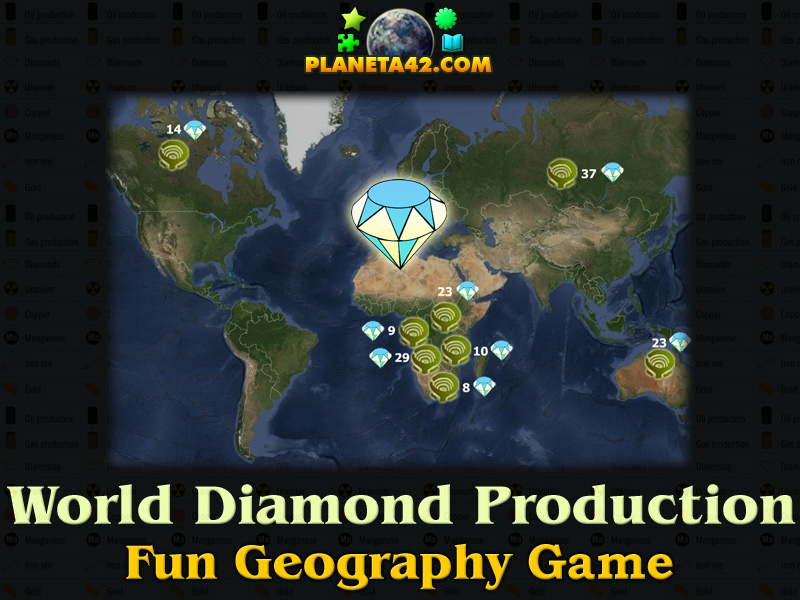 Click on a region on the map to dig for diamond, and collect 150 million karats. A small educational game for desktop computers, laptops and tablets, which may be played in the web browser. The Geography Knowledge Board include world map and 29 hidden places to play with. The game is part of the Interactive World Maps educational tools. Which country produce most diamond mineral resource? How many carats of diamonds are produced per year? What are diamond yield rates for 2016? Where to dig for diamond? What is the production of diamonds per year of Canada? Which continent produce most of teh diamonds in the world? How to play World Diamond Production. There is the map of the world and 20 drills on the top right of the screen. Click on the locations of the map to see how much carats of diamond that region produce per year. The ammount of the diamond production will be added in the bottom counter and one drill will be lost. The purpose is to collect 150 million carats of diamond per year, before you run out of drills. The amount and locations are approximate and some regions will yield 0 diamond to make the exercise more difficult. The exact amounts of diamond production by country are in the "class subject" section. Know the continents that produce the most diamonds in 2016 and get +1 Knowledge Level. Class subject: World diamond production by country. The formation of natural diamond requires very specific conditions - exposure of carbon-bearing materials to high pressure, ranging approximately between 45 and 60 kilobars (4.5 and 6 GPa), but at a comparatively low temperature range between approximately 900 and 1,300 °C (1,650 and 2,370 °F). These conditions are met in two places on Earth; in the lithospheric mantle below relatively stable continental plates, and at the site of a meteorite strike. The following is a List of countries by diamond production for 2016. Labels: Resource Games , Interactive Maps , Mineral Games , Geography Games , Education Games , Free Online Games.